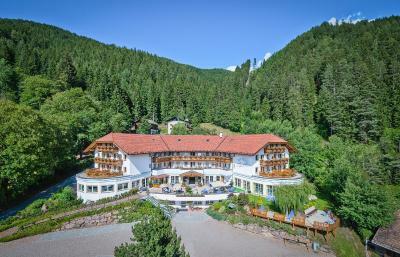 Lock in a great price for Hotel Marica – rated 9.5 by recent guests! Very hospitable owners' family who also run the place. Truly great experience. When in Obereggen again will definitely stay in Marica again. This is without a doubt one of the best family owned hotels out there. They make you feel like one of them, nothing is to much trouble. The food is five stars and so is the wine. Can not say enough about this hotel! Fantastic!! Excellent facilities, very nice hotel, great SPA, great breakfast. 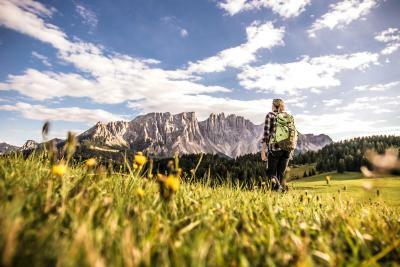 Location also really good (especially if you have a car) as at the very heart of a group of beautiful valleys, with hundreds of great walks (in summer) and access to an amazing network of ski resorts. Abbiamo scelto questa location per qualche giorno di relax e tutto è stato perfetto e al di sopra delle aspettative! 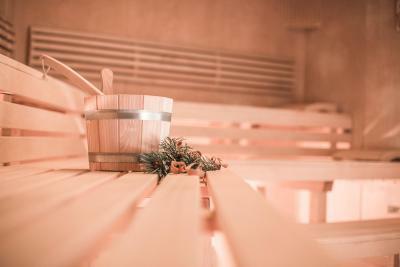 La struttura è nuovissima e fornita di tutti i comfort a disposizione degli ospiti: spa con sauna, bagno turco, area relax, tisane - piscina con idromassaggio - palestra - area giochi - sala per gli sci e bici attrezzata. Ogni giorno vengono organizzate attività diverse, dalle escursioni a dimostrazioni in cucina, eventi... Tutto curato nei minimi dettagli dal personale. Per recarsi sulle piste (a 5 minuti di distanza) è invece possibile usufruire di una navetta dall'Hotel, senza bisogno quindi di usare la propria auto. A chiudere il cerchio la cucina eccezionale con piatti sempre ricercati, ma mai troppo elaborati o pesanti. Per questo suggeriamo di fare la mezza pensione per godere a pieno dei menù del giorno, perchè meritano! Speriamo di tornare presto! Tutto. Cordialità del personale. La struttura. La colazione e la cena. La facilità nel raggiungere gli impianti. Proprietarii și personalul au fost foarte amabili,prietenoși și draguti! Am spus că mănânc fără gluten și in fiecare dimineață și seara am avut pregătită mancarea fără gluten(mulțumesc frumos!!)! Mâncarea foarte buna și diversificată atât la micul dejun,cât și la cină. Sauna foarte curata. Un lucru pe care nu l-am întâlnit nici in hotelurile de 4* din Austria,a fost faptul că in prima seară am comandat o sticlă de vin și o sticla de apa 0,75l,pe care le-am consumat pe jumătate.....surpriza a fost in a doua seară când le-am găsit pe masă 🙂 Niște oameni deosebiți,muncitori,care merită tot respectul!! Recomand tuturor hotelul! Struttura nuova molto accogliente! Staff gentilissimo.. ottime cena e colazione!! Hotel Marica This rating is a reflection of how the property compares to the industry standard when it comes to price, facilities and services available. It's based on a self-evaluation by the property. Use this rating to help choose your stay! 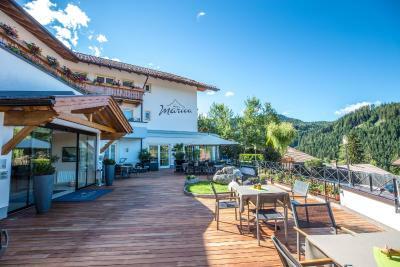 Located in the center of San Nicolò d’Ega in South Tyrol, Marica Hotel offers rooms with a balcony or a terrace. It features a pool, wellness center, restaurant and garden with children’s playground. Rooms at the Marica are set on 3 floors and can be reached via a elevator. They include extra long beds, a mini-bar, and private bathroom with bathrobes. Free Wi-Fi and wired internet are available in the public areas. Buffet breakfast is served in the restaurant and consists in cold cuts, cheeses, yogurt, croissants and scrambled eggs. The restaurant serves South Tyrol and national dishes. 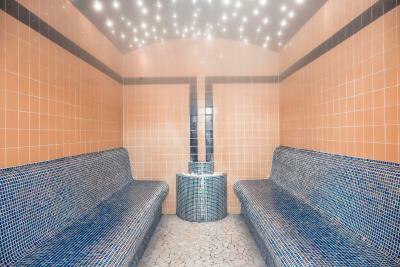 The free wellness center includes an indoor pool, fitness corner, sauna and Turkish bath. Massages are available at extra costs. The hotel’s shuttle bus runs twice a day and will take to the Obereggen ski slopes. Alternatively, the town ski bus stops 650 feet from the property and is free of charge. When would you like to stay at Hotel Marica? Comes with a balcony or furnished terrace overlooking the woods. Includes modern wood furniture, carpeted floors, and a private bathroom with bathrobe. Can accommodate an extra sofa bed. Comes with a balcony or furnished terrace overlooking the woods, the town or the valley. Includes modern wood furniture, carpeted floors, and a private bathroom with bathrobes. House Rules Hotel Marica takes special requests – add in the next step! Hotel Marica accepts these cards and reserves the right to temporarily hold an amount prior to arrival. The restaurant opens only for dinner. The room we got was facing the rear (looking part at a small internal garden and part at the upper side of the parking lot) - given the position of the hotel (overlooking the centre of the valley) and the beautiful views from the front-facing rooms, I found that quite disappointing (I did ask whether we could change the room, but unfortunately there were none available....). If you go, make sure you ask in advance (and pay, if it comes with an extra) for a front-facing room!